Robin Yount, Paul Molitor, and… Ryan Braun? While it may seem a bit premature to add Braun to a list with two Hall of Famers, the three do share many similarities. Each was drafted by the Brewers and rose quickly through the team’s farm system. Each, through Braun’s fourth season, was named to the All-Star Game at least three times as a Brewer. In 1982, Yount and Molitor helped lead Milwaukee to its first World Series. Braun brought the Brewers to their next playoff appearance, 26 years later. Undoubtedly, Braun has a long way to go to reach the level of Yount and Molitor — Hall of Famers and all-time Brewers fans favorites — but it certainly is not too hard to imagine him getting there someday. In just four seasons with the Brewers, Braun has reached a level of personal success and popularity that has not been achieved in Milwaukee since the glory years of Yount, Molitor and Harvey’s Wallbangers in the 1980s. A quick look at Braun’s accomplishments through the end of 2010 — a down year by his high standards — will show that in just four seasons, Braun has already become one of the best in Brewers history. Let that sink in. Braun, at 27, is already one of the best in franchise history, regardless of how the rest of his career goes. That fact alone assures that if Braun maintains even his 2010 performance level, he could certainly find himself mentioned among the greatest Brewers of all time. Start with the All-Star selection, an honor Braun even admitted he may not have deserved after the first half of the 2010 season. Whether he did or did not deserve it, Braun was elected to start for the National League for a third straight year. Braun also led all Major League outfielders in voting for the third consecutive season, despite playing in the smallest media market in baseball. Despite a prolonged slump in the middle of the season, Braun rebounded late last season to add some postseason hardware to his trophy case. Braun earned another Silver Slugger Award, his third straight, joining Cecil Cooper as the only player in franchise history to achieve such an accomplishment. Yount is the only other Brewers hitter to win the award three times, which he did over the course of his 20-year career. Despite hitting a career-low 25 home runs in 2010, Braun also became the first player in Brewers history with 20 or more home runs in each of his first four season. Not bad. Especially considering Braun has more of a gap-to-gap approach than most sluggers.Braun also joined Richie Sexson and Prince Fielder as the only Brewers with 100 or more RBIs in three consecutive seasons, while becoming the second player in club history to post back-to-back 100-RBI, 100-run seasons, another mark previously achieved only by Cooper. All that, in what was easily his worst statistical season in the Major Leagues. In 2007, Braun exploded onto the scene in Milwaukee, belting 34 home runs and tallying 97 RBIs, despite not being called up until May and playing just 113 games. Braun also batted a career-best .324 in his rookie season, with a 1.004 OPS. Despite playing less-than-stellar defense at third base, Braun picked up the National League Rookie of the Year award, while even garnering a few votes in the NL MVP race. By comparison, neither Yount nor Molitor were named rookie of the year in their first seasons with the Brewers, though Molitor did finish second in 1978. Starting at a white-hot pace that even the best MLB hitters would struggle to maintain, Braun answered with an equally impressive season in 2008. Some struggles were evident, though. While playing in 38 more games than his rookie season, he added only three home runs and nine RBI to his rookie totals, and his batting average went down. But Braun finished third in the NL MVP balloting after helping lead the Brewers to the playoffs. While he’s still just heading into his fifth season in the big leagues, Braun’s numbers put him among the greatest Brewers off all time. Braun’s career highs in home runs (37) and RBI (114) are equal to or better than those of Yount and Molitor. His 1.004 OPS in 113 games as a rookie was better than any in the two Hall of Famers’ combined 41 seasons, though Molitor did post a 1.003 in 1987 over 118 games. If he can maintain the necessary pace to keep his name in the discussion with players like Yount and Molitor, Braun will go down as one of the all-time fan favorites in franchise history as well. His popularity is impossible to miss at Brewers games, as the team store is filled with No. 8 jerseys and t-shirts, while fans and even the kids of some Brewers teammates walk around with ‘Braun’ on their backs. Of course, if a Brewers fan is not wearing No. 8, there’s a good chance their shirt or jersey has a No. 4 or No. 19 on it. With the numbers he’s put up over the years, you could put together quite the highlight reel featuring Braun and only Braun. In 2010 alone, he had a diving catch in the All-Star Game, climbed the wall to bring one back in September at San Francisco, hit a walk-off single against the Pirates in early July and had a two-homer performance in the home finale against the Marlins, just to name a few. Braun’s biggest moments to date came in just his second season, however, with the Brewers in the middle of the wild card race. In a must-win situation on September 25, with the game tied 1-1 in the bottom of the 10th, Braun blasted a walk-off grand slam off the Pirates’ Jesse Chavez. The win kept the Brewers and Mets tied for the wild card lead after New York had enjoyed its own walk-off victory earlier in the day. Just days later, Braun had what remains to date as the defining moment of his young career. With two out in the bottom of the eighth, the game tied 1-1, and runner on first, Braun stepped into the kind of moment most players can only dream of. As Chicago reliever Bob Howry delivered a 93-mph fastball toward the inner half of the plate, Braun’s eyes lit up. Howry’s pitch was a mistake, and Braun made him pay for it, blasting a tie-breaking, two-run home run to help the Brewers defeat the Cubs and clinch the wild card for their first playoff birth since 1982. From the moment the ball jumped off Braun’s bat, it was clear that it was gone. Braun knew it, as did Howry, the 45,299 in attendance, and the thousands watching at home. All the Brewers had to do then was hold on and wait for the Mets to lose two hours later. Once they checked both those items off the list, the Brewers were set to play meaningful baseball games in October for the first time since Ronald Reagan was president. With those two home runs, and the role he played in leading the Brewers back to the postseason for the first time in 26 years, Braun — in just his first two years — firmly established himself in franchise history. But does all that, along with his status as a fan favorite under contract for five more seasons, make Braun the face of the Milwaukee Brewers franchise? While he came up to the Majors after fellow fan favorite Fielder, the connection between Braun and Brewers fans is unmistakable, and it’s something that’s never quite been the same case as far as Fielder is concerned. With Ben Sheets no longer a part of the organization, Braun has supplanted the former Olympic gold-medal winning ace as the face of the Brewers franchise. What’s more, with the Brewers as a better team today, it seems Braun is even more popular than Sheets, who played for years on sub-.500 ballclubs in Milwaukee. Boosted by the Brewers’ success, Braun’s popularity has soared, as he has been emblematic of the Brewers franchise as a whole. 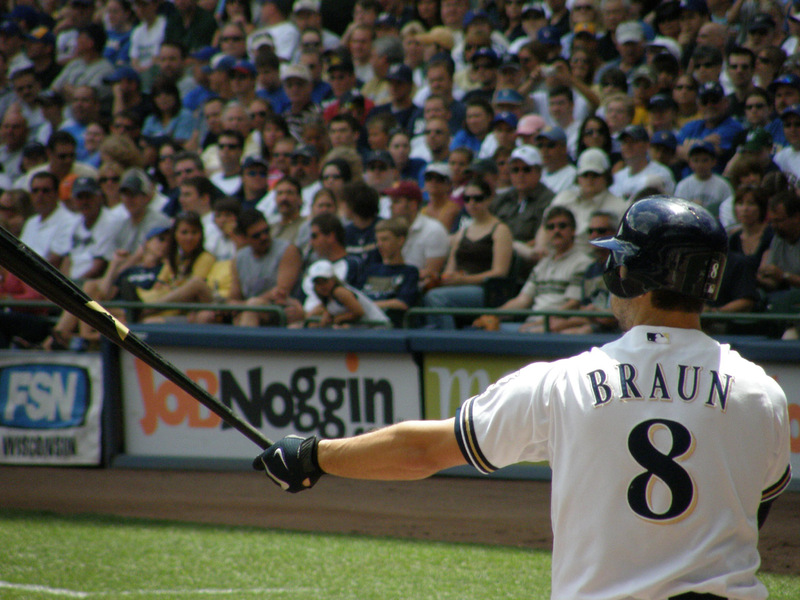 Braun’s rapid rise through the ranks and finally to the Major Leagues in May 2007 mirrored the rise of the franchise. Just as Braun impressed in 2007, but did not play a full season, the Brewers led the NL Central for an extended period before eventually coming up just short behind the Cubs. In 2008, Braun was with the team for a full season, putting together an MVP-caliber performance in leading the Brewers, who finally got over the hump and reached the playoffs again. And don’t forget that home run in September. After the thrilling 2008 season, Braun and the Brewers took a step back in 2009, and yet another in 2010. But with the recent additions of right-handers Zack Greinke and Shaun Marcum from Kansas City and Toronto, respectively, Braun and the Brewers fanbase are excited about the potential for the 2011 season. And rightfully so. Based on all the excitement surrounding Greinke’s arrival in Milwaukee, though, the Brewers left fielder may have some competition for the team’s most popular player. Greinke has certainly given him a run for his money so far in the team store. Of course, Braun’s connection to the fanbase goes well beyond his on-field performance. For most, the cold and snow that come along with a Wisconsin winter provide excellent reasons to head south to warmer climates. In early December this off-season, Braun did just the opposite. Trading 70-degree weather for temperatures just below freezing, the Los Angeles native spent several days in the Dairy State. Braun was in southeastern Wisconsin to promote Limelite, a new energy drink, while also partaking in the Lake Geneva holiday festivities. Since signing a seven-year contract extension — one that should keep him in a Brewers uniform through the 2015 season — Braun has established himself as far more than a baseball player. Braun has developed and marketed his own personal brand, which includes the clothing line Remetee and two local restaurants, Ryan Braun’s Waterfront in Milwaukee and Ryan Braun’s Tavern and Grill in Lake Geneva. On December 5, as part of his ongoing involvement in the Lake Geneva community, Braun served as the grand marshal of the 35th annual Great Electric Children’s Christmas Parade. Following the early evening parade, Braun held an appearance at his restaurant, signing autographs for fans. Braun’s affinity for the Lake Geneva area is something that has developed over his years with the Brewers. The left fielder has spent many an off-day in the quiet community less than an hour southwest of Milwaukee. Because of his love for the popular tourist destination, Lake Geneva was a no-brainer location for Braun’s second restaurant. When the restaurant opened in late June, the fan turnout was overwhelming. Fans traveled near and far to catch a glimpse of Braun, take a photograph with him, or even get the three-time All-Star’s autograph. One incredibly dedicated family drove more than 10 hours from their Michigan home for the event. While the outpouring of support for his restaurant opening was a surprise to him, Braun’s popularity was clearly on display throughout the night, with requests for autographs and photos seemingly never ending. After arriving around 7:30 p.m., to large crowds waiting both inside and out, Braun finally was seated with his private party for a quiet meal nearly two hours later. It’s not hard to figure out what’s behind Braun’s incredible popularity among Brewers fans. Since coming up in May 2007, he’s been, without question, the club’s most consistent hitter, while also providing a number of hugely memorable moments through his first four seasons. Another thing that has drawn Brewers fans to Braun — while simultaneously turning away opposing clubs, announcers and fans — is his unwavering confidence, something that occasionally borders on cockiness. Some may view Braun as cocky or see his demeanor as an issue, but it’s something that certainly can be a benefit to Braun, especially with a grueling six-month, 162-game schedule. Everyone goes through slumps, but it’s how you react to them that determines how successful you’ll be. It’s 4:45 p.m., on Aug. 2, 2010. With his team sitting nine games under .500 and 11 games behind the NL Central-leading Reds, Braun stands by his locker in the tiny visitor’s clubhouse at Wrigley Field, fielding questions about his recent slump. As he speaks, his batting average is a very un-Braun-like .274, and he has just 16 home runs, 64 RBI and a .787 OPS through 104 games. After jumping out to a hot start early, Braun has batted just .236 with 10 homers, 36 RBI and an OPS of .671 since being hit on the elbow by a Tommy Hanson fastball on May 10. Over the month of July — the same month in which he was named to a third straight All-Star Game — Braun’s struggles were even greater, as his batting average was just .200 with five home runs, 15 RBIs and a .615 OPS in 26 games. Despite this, however, Braun still had a relaxed, cool confidence about him. One that really made you believe he was not worried about what his numbers were so far. “I just try to move on, man,” Braun said. “There’s no reason to dwell on the past, dwell on what’s negative. For me, I try to stay positive, stay optimistic and move forward. I can’t go back and get an extra 20 hits or 10 home runs or drive in an extra 30 runs. No, he certainly could not do any of those things. But if he could have, his numbers would have looked a lot more standard. Add those 20 hits, 10 home runs and 30 RBIs, and see what you get. It’s a Braun with a .298 batting average, 26 home runs and 94 RBI. Through 104 games the previous season, Braun hit .318 with 22 home runs and 74 RBI. In 2008, he had hit at a .303 clip with 29 homers and 81 RBI. As a rookie, Braun had a .322 average through the same number of games with 31 home runs and 85 RBI. A quick look at the stats show his power numbers dropping year-to-year, while his batting average remained fairly unchanged until 2010. But the important numbers are not the ones through 104 games. No, all anyone truly will look at down the road are Braun’s numbers over the course of the entire season. As Braun stood there that day, he knew there was more than enough time to improve upon those. “My whole thing is that I have two months left,” he said. “If I finish strong, there’s no reason I can’t have just as good a season I had last year. There’s no reason I can’t have my best season if I finish great this year. There’s no reason for me to reflect until the end of the season. As it turns out, Braun would not have to wait two months for things to improve. That very same night, he batted 5-for-7, slapping five singles from gap to gap, while scoring three runs and driving in two more as the Brewers embarrassed the host Cubs, 18-1. The next day, Braun was 3-for-4, and then 1-for-3 in the series finale, giving him a 9-for-14 mark with two RBIs and four runs over the series. If you were to reflect after the season, Braun’s numbers would be excellent by most standards. But when you average more than 34 home runs and 105 RBIs a season while hitting at a .308 clip over your first three years in the big leagues, you set a pretty high standard for yourself, and everyone else’s expectations are raised as well. Even so, Braun’s slash line of .304/.365/.501 was down from the past, but still very respectable. Braun batted .364 over his final 55 games with nine home runs and 35 RBI to boost his numbers, but his OPS of .866 was still a career-low. Still, his 25-home run, 103-RBI season earned him 19 points in the NL MVP balloting, good for 15th out of 25 players listed on ballots in 2010. But what caused the down numbers for Braun? He often spoke of facing adversity, though he never truly clarified what he was referring to. The struggles were the first prolonged slump of Braun’s career, and all indications would point to injuries being the cause of such struggles. His numbers dropped off noticeably from early May, when he was hit on the elbow with a pitch, until he snapped out of the slump in August. Yet, the Brewers slugger would never acknowledge any injury as the reason for his struggles. Instead, he just referred to dealing with unspecified adversity. Fortunately for Braun, the Brewers and their fans, his late-season hot streak provided some assurance the “real” Braun could return for the 2011 season. In fact, a “down” year in 2010 is no reason to believe Braun won’t be better than ever in 2011. After all, he’ll need to make up some lost ground to reach Yount and Molitor. MILWAUKEE — Entering their series finale, the Marlins were tied with the Braves for the fewest home runs allowed in the Majors this season, while the Brewers’ offense was tied for second in the National League with 175 homers in 2010. The Brewers were the clear winners in that battle Sunday, belting four home runs in the first three innings en route to an easy 7-1 victory over the Marlins in their home finale at Miller Park. With the four long balls, the Brewers overtook the Reds for first place in the NL in home runs. Ryan Braun opened things up with a two-run blast in the first, and Lorenzo Cain added a no-doubt solo shot in the second, the first of his career. It was clear at that point that Marlins starter Adalberto Mendez was in for a rough outing. For good measure, Braun added a second two-run homer in the third. Two pitches later, Prince Fielder belted his 32nd of the season, marking the end of Mendez’s start. Lasting just two innings, Mendez’s start was by far his shortest since being called up earlier this month. In three previous September starts, Mendez was 1-1 with a 1.56 ERA, giving up just three runs on 15 hits over 17 1/3 innings pitched. With his Sunday outing of two-plus innings and six runs on six hits, Mendez’s ERA jumped to 4.19 as he took his second loss of the season. The problem was an inability to be effective with his slider. Even with his slider not working, Mendez expected better results out of his fastball. Unfortunately, it was up more often than not and Mendez struggled to execute pitches against the Brewers. All the offense the Marlins could produce came in the first inning as three straight hitters reached base and Gaby Sanchez delivered Ozzie Martinez from third with a sacrifice fly. Beginning with Sanchez’s flyout, Brewers lefty Chris Capuano retired 16 of the final 18 Marlins batters he faced. Capuano (4-4) left after just 72 pitches with a left groin strain, but not before delivering six strong innings and allowing just one run on four hits and a walk with a strikeout. His win came amid a celebratory atmosphere at Miller Park, which included several standing ovations from the home crowd. Braun took a curtain call after his second home run, and Fielder had one of his own after being removed in the eighth after what may have been his final plate appearance in a Brewers uniform at home. Finally, all-time saves leader and former Marlins reliever Trevor Hoffman entered to his signature “Hells Bells,” closing out the Brewers’ 7-1 victory. Mendez’s poor outing also cost the Marlins a chance to split the four-game series with the Brewers, while also dropping them back below .500. Sitting at 77-78, the Marlins will need to win four of their final seven games to finish at an even .500 this season. Their road record dropped back to 39-39 with three games remaining away from Sun Life Stadium. The Marlins will need to take two of three from the Braves to secure a winning road record for the 2010 season. The highlight of the game for the Marlins turned out to be an impressive Major League debut for reliever Steve Cishek. After being recalled on Tuesday, to bolster the Marlins bullpen, Cishek finally made his first big league appearance in relief Sunday. With his club trailing 7-1 in the sixth, Cishek pitched two perfect innings, inducing three ground ball outs, a popup and two fly outs. After needing only 18 pitches, 16 of which were strikes, to retire six batters, Cishek’s manager liked what he saw in his debut. MILWAUKEE — On any other night, Randy Wolf’s performance would have been the story of the game. But with the way the Brewers hitters were swinging the bats in a 13-1 victory over the Reds, a quality start and a 2-for-4 performance at the plate got lost in the shuffle. Making Wolf’s outing even more impressive was the way he responded after his club put up eight runs in the second and five more in the next three innings. Often with such long innings offensively, a team’s pitcher tends to struggle going back out on the mound. Wolf just got better as the game went along. “There were some long breaks, but the main thing is, when it’s that kind of score, you’ve got to go out there and feel like it’s 0-0,” Wolf said. “If you go out there and you see it’s 8-1, 13-1 … all of a sudden it’s four runs, five runs and they’re creeping their way back. Not only did Wolf pitch well as his team sent 34 hitters to the plate in the second through fifth innings, he did so after fighting through a rough first inning. Wolf opened the game giving up three singles and a walk in the top of the first. Fortunately, the veteran lefty managed to hold the National League Central-leading Reds to just one run in the inning. With a fortunate out on his side, Wolf got the next batter to hit a grounder back to the mound. But with just one out to go in the inning, he walked Jay Bruce and surrendered back-to-back singles before striking out Yonder Alonso to end the inning. That strikeout was the first of four in a row for Wolf and the beginning of a stretch of 11 consecutive batters retired. Wolf did not allow another hit until a leadoff double in the sixth off the bat of Paul Janish, who replaced Orlando Cabrera at shortstop. Tossing six strong innings while allowing just one run on four hits with seven strikeouts against two walks, Wolf posted his fourth straight quality start in September. This month, Wolf is 3-1 with a 1.21 ERA, allowing just four runs on 18 hits in 29 2/3 innings pitched. Since his infamous 12-run outing in Pittsburgh, Wolf has gone 6-2 with a 2.57 ERA in his last 11 starts, giving up 21 earned runs over 73 2/3 innings pitched. In his 31 other starts not including that July 21 loss, Wolf is 13-10 with a 3.81 ERA.